Dubai, UAE, April 1, 2018: The American global coffee and doughnut company has become a household name in the UAE, since its first outlet opened in 1997, and consolidated business in the coffee-loving nation with more than 65 stores serving a multitude of delicious doughnuts, bagels, other baked goods, and a variety of hot and iced beverages. Owing to its ever-growing popularity and fan following, Dunkin’ Brands International and Continental Foods, the owner of the Dunkin’ franchise in the UAE, have collaborated to take the Dunkin’ experience to the next level with the introduction of a first-of-its-kind café concept not just in the UAE, but the larger Arab region. 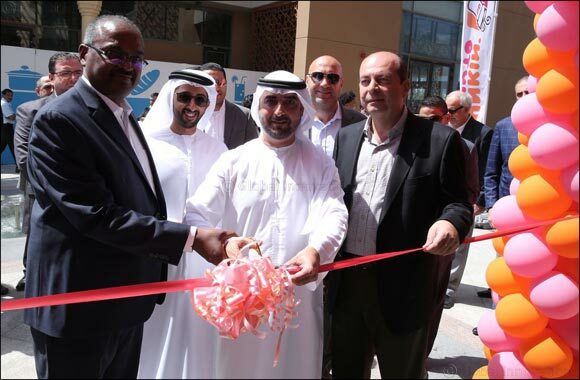 The first Dunkin’ Café was inaugurated today (Wednesday) at Sharjah’s popular lakeside leisure destination, the Al Majaz Waterfront. “We extend a warm welcome to the residents and citizens of Sharjah and the UAE to come and savour their favourite Dunkin’ experience in a whole new light,” he added. With double the space offered indoors, cosy lounging arrangements, outdoor seating to enjoy the waterfront views, free Wi-Fi, and an intuitive staff offering exceptional service, the Dunkin’ Café is unlike its predecessors. Once guests are smitten by the vibrant atmosphere of this place, they can get ready to fall head-over-heels for their new and exclusive café menu. Starting with new items including Wonuts, Banana Eclairs, Freak-shakes and Lemonade jars to satiate that sweet tooth, to all-day breakfasts, mid-morning snacks, wholesome lunches and healthy dinners, not to mention the signature aromatic Dunkin’ brews made from 100% Arabica beans – the Dunkin’ Café journey has been crafted to appeal to the sensibilities of people of all age groups and preferences. CEO, Marwan Salha, said: “UAE is a key market and we are expanding steadfastly to be able to reach out to the maximum number of people in the UAE communities. We are expanding across all emirates through diverse retail opportunities at malls, universities, gas stations, metro stations, and supermarkets. “We plan to hit the 80-stores mark by end of 2018 and plans to open more cafés concepts are underway,” he added. Staying true to tradition, Dunkin’ Donuts will continue to offer its attractive bundle packages at the new café. A breakfast meal with a free coffee or a doughnut and coffee combo – all for AED 10 – or their new limited time offer, which entitles customer to two dozen doughnuts for the price of one, all up for grabs.